From January 2013 every model in the BMW car range will have DAB digital radio as standard. DAB radio has become increasingly popular over recent years thanks to improved audio quality and the broader range of radio stations it offers, both regional and national. BMW is the first mainstream manufacturer to move over to standard DAB. CAP – which predicts the residual values for cars – suggests the move will force other manufacturers to follow suit sooner rather than later. DAB Radio will eventually take over FM signals entirely, perhaps as early as 2015. In car DAB radio availability has steadily increased over the past two years. In early 2010 3.8% of cars registered had DAB radio as standard but by Autumn 2012 that number had risen to 25.5%. A further 26% offer DAB as an option but still means just under half of current models have no DAB availability at all. “BMW’s announcement this week that DAB would become standard across their entire model range is a real shot in the arm for a less piecemeal approach by the industry to DAB.” Continued Saville. 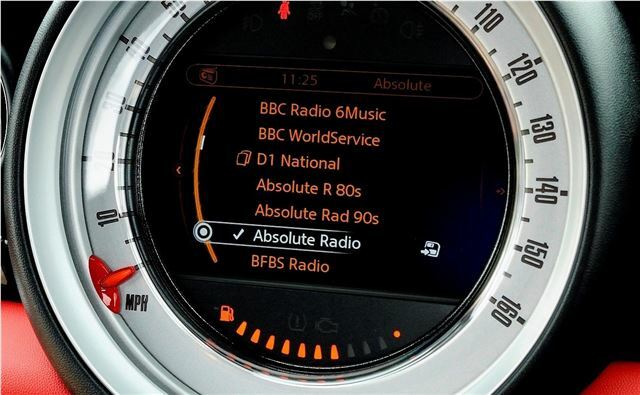 BMW has also recently announced a retrofit kit to allow older models to receive DAB radio. The kit fits discreetly behind existing audio units and costs £299 from BMW dealers. are VW not a mainstream manufacturer then? VW offers standard DAB on everything ... apart from Up.